The looking glass and the wide range of mirrors used in telescopes and scientific equipment have an enthralling history associated with their primitive origin. Perhaps, the first mirror was ‘still water’, but the oldest manufactured mirrors were polished stones and then metals. A German professor by name Justus Von Liebig was the first to use a finalized silvering method to make glass mirror. Mirrors were first made from Obsidian, a volcanic rock that occurs in nature. Dating back to about 6000 BC, obsidian mirrors have been discovered in Turkey. Polished metal mirrors were made from copper, brass and bronze. Egypt and Mesopotamia are known to have used copper mirrors, wile China is said to have used bronze mirrors. On the other hand, the Mesoamericans used polished stone mirrors, particularly volcanic glass. Moorish Spain became popular for its clear glass mirrors around the eleventh century. By the sixteenth century, Venetian glassmakers discovered the technique of using mercury to make glass mirrors. Several cultures related the mirror to the sun due to its reflective property coupled with catalytic nature. Mesoamericans were fascinated by obsidian glass mirrors and used them in jewelry and even as emblems of rank during the Omlec period. Concave and parabolic mirrors were useful as tools to direct the sun’s rays to make fire. Early Mexicans made mirrors from iron pyrites and volcanic glass. Mirrors were related to their god of rulers, soldiers and sorcery. Named Tezcatlipoca, his name is described as ‘Smoking Mirror.’ In the Post-classic era a mirror was used in place of his feet. Obsidian comes in colors ranging from black to semi-transparent green and was also used in divination. 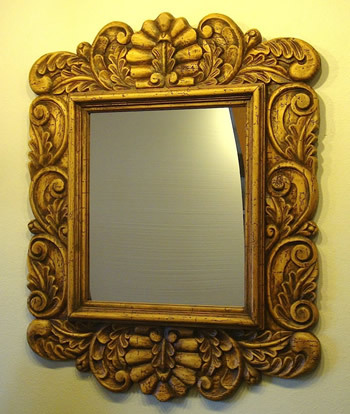 Over the centuries, luxurious antique mirrors have adorned palaces and homes. Mexican mirrors are embellished with its exceptional crafts, such as Talavera and painted tin. The creative designs reflect the rich tradition and expert workmanship of artists during the colonial period. Oaxaca is known for its hand-painted mirror frames, available in a wide array of colors and shapes. Elaborate patterns are punched meticulously into the tin through a laborious process. Punched techniques reflect the Mexican rustic décor and the decorative frame is crafted in several forms, such as oxidized, silver and copper frames. Mexican antique mirrors exemplify the rich and varied culture of indigenous Mexican groups over several periods, ranging from the Pre-Columbian era to the colonial era and the neoclassical era.